Yesterday, we reported that a number of ill-meaning people have allegedly squeezed their way into the life of iconic comic book creator Stan Lee since the death of his wife last year, with Lee’s longtime attorney and assistant both being suddenly and mysteriously fired in a supposed attempt to stop them from protecting him. Lee’s 67-year-old daughter, J.C. Lee, is at the center of these accusations, with sources from a Hollywood Reporter investigation saying she has a habit of spending her father’s money on credit cards and allegedly becoming verbally abusive and emotionally manipulative when she doesn’t get the money she wants. 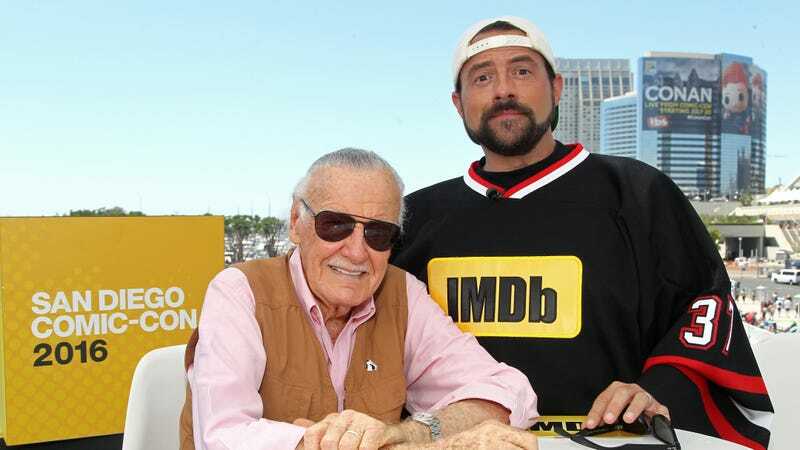 Now, iconic comic book fan (and occasional comic book writer) Kevin Smith has stepped in, telling Lee on Twitter, “you are always welcome to come live with me.” Smith also asks Lee to let fans buy him a new place to live so he can get away from the people supposedly trying to exploit him, but it seems unlikely that anything will actually come of this. There are three men reportedly working with Lee’s daughter now, all of whom have faced allegations of stealing either money, memorabilia, or even blood from the man they’re ostensibly helping to care for, and they’ve even had Lee’s phone number changed and insist on reading all of his emails (because of his “macular degeneration”). Basically, if you buy the story that Lee’s daughter and these other men have found ways to manipulate every aspect of Lee’s life, it seems unlikely that Smith’s tweet would even reach him—let alone inspire the 95-year-old man to escape and go on the run.